You are invited to support a special scholarship to celebrate the 80th anniversary of the opening of the New England University College, which later became the University of New England. Your donation to this appeal will help to establish an endowed scholarship offered in memory of the pioneering students and staff of the New England University College (1938-1954). The scholarship will be for students from across Northern NSW to receive assistance to attend and study on campus at the University of New England (in any subject). To establish an endowed scholarship offered in memory of the pioneering students and staff of the New England University College (1938-1954). The scholarship will be for students from across Northern NSW to receive assistance to attend and study on campus at the University of New England (in any subject). The New England University College (NEUC) opened in 1938 with five staff and twenty four students in the historic Booloominbah Homestead on a hill near Armidale offering a range of courses and subjects. The College ran until 1954 when it became the University of New England. Students were drawn from small and isolated communities across northern NSW from Maitland to Tweed Heads, which is still the main catchment for UNE. Following in the tradition of NEUC, the University of New England is committed to providing regional students with a high quality tertiary education no matter where they may reside. This can be through distance education delivered online or through living in one of our residential colleges or in Armidale while studying on campus. UNE provides an excellent student experience and quality education, and was recently awarded the five star rating for overall student experience by the 2018 Australian Good Universities Guide for the 13th year in a row, the only public university to achieve that milestone. The recent Universities Australia 2017 Student Finances Report surveyed over 18,000 students around Australia and identified some of the financial hardships facing students. The report said that ‘One in seven domestic students say they regularly go without food or other necessities because they can’t afford them.’ While students who worked while they studied said ‘that their paid work adversely affected their university studies’ as they had to miss lectures or classes regularly as part of their employment. The costs and expenses associated with full-time study can be prohibitive to young people in rural areas who need to take time out from working on their family farm or property in order to study on campus. The scholarships offered by the University of New England each year aim to ensure that a university education is accessible to a wide cross section of the community. With your support we will offer one or more NEUC Scholarships to assist students from across the region to attend UNE. In order to offer a single NEUC Scholarship of $6,000 every year we need to receive $150,000 in donations, these funds will be invested by the UNE Foundation with the income generated supporting the costs of offering the scholarship. Your donation will be invested by the UNE Foundation and the annual NEUC scholarship will be administered and awarded through the UNE’s Student Success program once sufficient funds have been received. 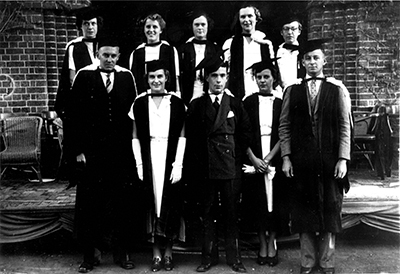 To find out more about the 80th anniversary of the New England University College, click here. Make an online gift to UNE by using our Secure Online Donation Form located on this page. When payment is made please email remittance details to finrev@une.edu.au and be sure to include information about the designated fund for your donation. To donate over the phone please call 02 6773 2870. Our team will be happy to talk you through your giving options and answer any questions you may have.